The 2019 season has begun. We’ve started our schedule of Tuesday mornings and the 4th Saturday of the month between 10am and 12 noon. Come and see if this is the volunteering for you. The usual job is to prune the paniculatas and arborescens which flower on this year’s growth and cut out the dead wood from the macrophyllyas and serratas which flower on last year’s growth. 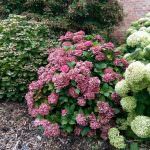 This year we’ll continue to thin out the hydrangeas in the outer garden and add the new ones growing on in our back gardens. As we do this we’ll keep up the battle with ivy, bindweed and bramble! The collapsed wall in the walled garden is due to be rebuilt. You will soon be seeing the new signage to the gardens from the café. We’re getting on with labelling each plant and tree. 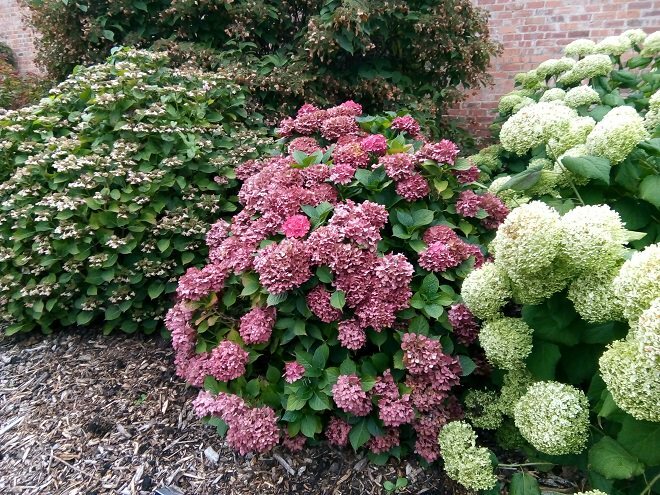 The world is being scoured for any new varieties of Hydrangea paniculata to add to our burgeoning collection. Our Open Day this year is on Sunday, 4 August with guided tours at 11am and 2pm. Meet us at the café. There is no charge but we survive on donations! We’ll be running private tours of up to 30 people (£4 per head) during the week beginning 5 August; morning, afternoon or evening. Contact us through our contact page for more details and to book.